There's certainly no doubt that Rhapsody usually delivers the latest and greatest to the Android crowd first, before eventually taking its on-demand goods elsewhere. Now, not long since completely redesigning its official application on Mountain View's mobile OS, the music service announced its newest app creation dubbed SongMatch (powered by Gracenote). As the name would adequately tell us, Rhapsody's app will make it relatively simple to learn more about previously-unknown tunes, with SongMatch offering a one-click feature which can quickly identify music info such as the artist, song and, naturally, the name of the album -- you know, similar to what you might see on apps like Shazam and SoundHound. 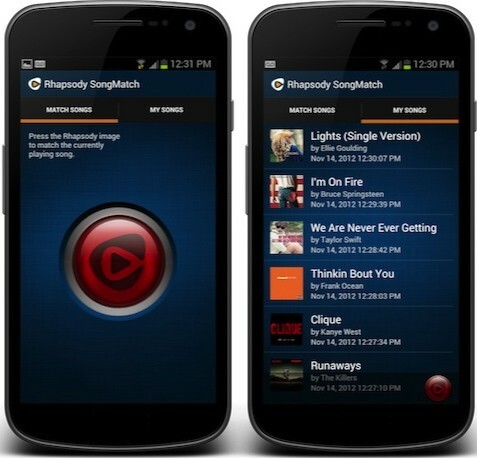 SongMatch is available as a gratis download on the Play and Amazon stores, and Rhapsody's quick to point out that the app will be great for current subscribers as well as newcomers who may not have an account -- that said, the company is hoping to lure some people in, adding that SongMatch is indeed "a great way to introduce new music fans to Rhapsody."